Last month, Oklahoma became the 46th state to ban texting and driving. The new law, which goes into effect November 1, makes texting and driving a first offense, meaning drivers can be pulled over and ticketed for texting alone. Previous versions required drivers to be pulled over for another reason before being cited for texting and driving. Although we are enthusiastic that the law has passed, it will not go into effect for several months and, even then, the law will not be able to stop every offender of texting and driving. If you or someone you love is injured in an auto accident caused by a distracted driver, contact our dedicated personal injury attorneys in Tulsa for a free case evaluation. The bill put forward by Rep. Terry O’Donnell, R-Tulsa, titled The Trooper Nicholas Dees and Trooper Keith Burch Act, was named in memory of two Oklahoma Highway Patrol troopers who were struck by a distracted driver while investigating an accident. According to reports, the driver was updating social media at the time of the accident. 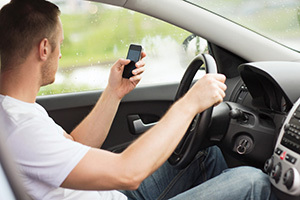 It is illegal to compose, send or read an electronic text message while the vehicle is in motion. This includes texts, email and social media messages. You can, however, do these things while at a stop light or stop sign if you vehicle is stopped. You can still use your phone as GPS and to play music, but if you look distracted, you can still be pulled over. You cannot shoot video or take photos while driving. You are still permitted to talk on your cellphone, though hands-free devices are recommended. Officers can seize your cellphone as potential evidence, but they cannot access any of its information without a warrant. There is a $100 fine for breaking this law. Once the law goes into effect, there will most likely be discussion as to exactly how the law will be enforced because citations will essentially become the officers word against the drivers. There are many dangers associated with texting and driving, and our attorneys have seen the devastating effects that these types of accidents can have. If you or someone you love is injured by a distracted driver, contact our experienced auto accident lawyers in Tulsa for help.